So you have the perfect dress envisioned for your wedding day only problem is you can’t seem to find it in any shops. What to do? Hire a seamstress, of course! Now if your seamstress has a boutique you would go in, chat and get to know one another, discussing fabrics and dress styles, what would look good on you in the way of color and cuts and price. Afterward she’d have you stand on a small pedestal and start taking measurements. If your seamstress is over the internet then you carefully take them yourself and send them to her. I’ve included this article in my blog because taking measurements is an area of knowledge that most girls have not needed till now or avoid. In the field of sewing the old adage of “measure twice, cut once”, is sage advice. While I’m not a sage, I will try to impart some guidelines to help you out. ~First off, never take your own measurements. ~Always have someone else help you. ~If you feel you are in over your head ask someone who knows how to sew to be your assistant. ~It’s a good idea not to wear bulky clothes or clothes so tight that it distorts your shape while measuring. ~Be sure to wear a comfortable, well fitting bra. ~Stand normally. Holding your arms out like a windmill will change certain measurements. Then you will have a garment that only looks good when you hold your arms out. ~When you measure, don’t pull the tape tight. If the skin is dipping in on each side of the tape, it’s too tight. Which means your dress will be too tight. Your seamstress knows how to make something close fitting, she needs your measurements to be accurate. ~Write your numbers in pencil. After you’ve double checked them they can be written in pen. ~Tie a string or cord around your waist, not too tight, not too loose. Bend and twist to get it to settle on your natural waistline. ~If you are planing on wearing heels with your dress, make note of the heel height and wear heels of that height while measuring. You posture changes with different heel heights, therefore, your measurements as well. 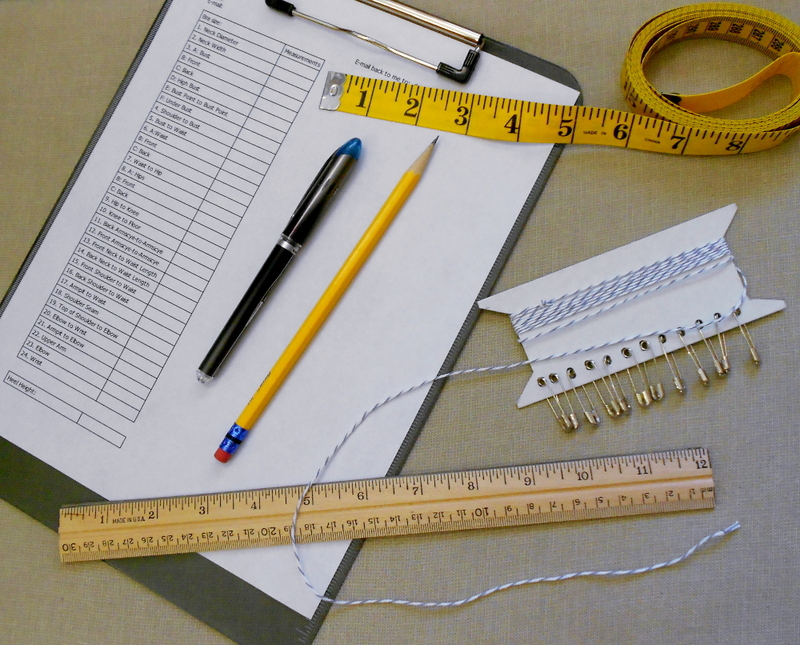 You should have on hand a measuring tape, your string on your waist, a ruler about 1″ wide, and some safety pins. Okay, you’re ready to get started…. Now, with each of the major measurements(bust, waist, hips) you need the total measurement, plus a front, and a back. The front and back are taken in the same place you took the total circumference measurement at, only it’s the amount measured from your side seam on one side to the side seam on the other, in the front and then the back. The side seam is the seam on your clothes that starts under your arm and runs straight down your side. If you have trouble finding it or your side seam isn’t straight, tie a string around your arm near the shoulder leaving a long piece hanging down. Tie a pen or something light on the end so it hangs straight. Now hold your arm out like a scarecrow. Mark this line on your clothes using safety pins. Your front and back measurements must add up to the total circumference measurement, if it doesn’t measure again, carefully. When this page is finished it will have 25+ measurements shown with, instructions on taking each, and a video. I hope this was helpful. I do apologize to anyone who feels that my succinct tutorial has caused them to lose their marbles. If you need any help please email me, I’ll be glad to help. For a measurement chart click here. Feel free to download it, fill it in and then email it back.